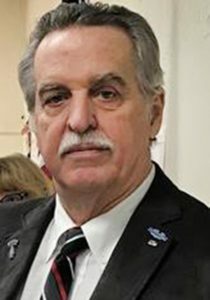 Don Bendell, GOP HD-47 nominee. But here’s the thing: Bendell’s Democratic opponent Bri Buentello reportedly didn’t even mention the story of Bendell’s failure to pay his child support in yesterday’s debate. It’s possible that she talked about it elsewhere, but the example Bendell cited was one of independent groups sending mail into the district–which Buentello has no control over. But it doesn’t really matter, because by bringing this up at the very end of their debate, it’s clear that Bendell is the one who wanted to talk about it. Referring to campaign mailers from a group called Our Colorado Values that have labeled him “Deadbeat Don,” Bendell said that wasn’t true and blamed his first wife, Linda Bendell, for turning his three biologic children against him when they divorced shortly after he left the Army in 1970. Those children— Britt, Brenna and Brooke— told The Chieftain they became alarmed when they heard their father was running for office in Colorado. “He’s not the man he appears to be,” daughter Brooke said. You see, the reason why there are mailers appearing in HD-47 accusing the Republican candidate of being a “deadbeat dad” is because he was in fact a deadbeat dad. It wasn’t the Democrats who brought Bendell’s failure to pay court-ordered child support to the media’s attention, it was Bendell’s own children. And while Bendell may have “fallen behind” on his child support decades ago, he only recently paid it back. It’s one of those situations where, although you may feel very strongly about saying something in your defense, you just shouldn’t. Bringing your closeted skeletons up voluntarily at the tail end of a debate, thus ensuring it’s the impression everyone attending was left with, is pretty much never a good idea, especially if you have no excuse to offer. Thus the “party of family values” veers off the rails once again. "That's right, I paid it all with interest! But only after interstate child support enforcement procedures enacted at the federal level made it reasonably feasible for my ex to enforce her North Carolina child support order in the state to which I ran away to avoid my child support obligations. And, of course, I never paid a goddamn penny until after my youngest had already reached the age of majority. Also, I am very sorry — sorry that my battle axe of an ex-wife couldn't just let me slide but instead pursued her legal rights." Jesus. This clown is the ideal spiritual successor to racist sociopath Judy Reyher. I've often heard if you don't have anything nice to say about someone, don't say anything at all. Good advice also when talking about yourself. At least the Republican deadbeat dad in Evergreen had the good sense to step aside. Perhaps he should get pledges of votes … which he can redeem in a suitable amount of time, say in 10 years. He can even get those votes increased by interest. In the meantime — anyone stupid enough to bring up something controversial in a final speech of a political debate, something that has not been in that debate, is not going to be an effective Representative. Imagine him doing the equivalent when it comes time to debate a bill on the floor. Democrat: "higher taxes" for roads …. Him: "Lower taxes … and by the way, the Democratic Representatives who don't agree with me are wrong when they said I'm a deadbeat Dad." This one has to sting hard for Moddy. He was Rehyer’s #1 cheerleader.